ISS043E190604 (05/13/2015) — SpaceX’s Dragon cargo capsule is seen here docked to the Earth facing port of the Harmony module. 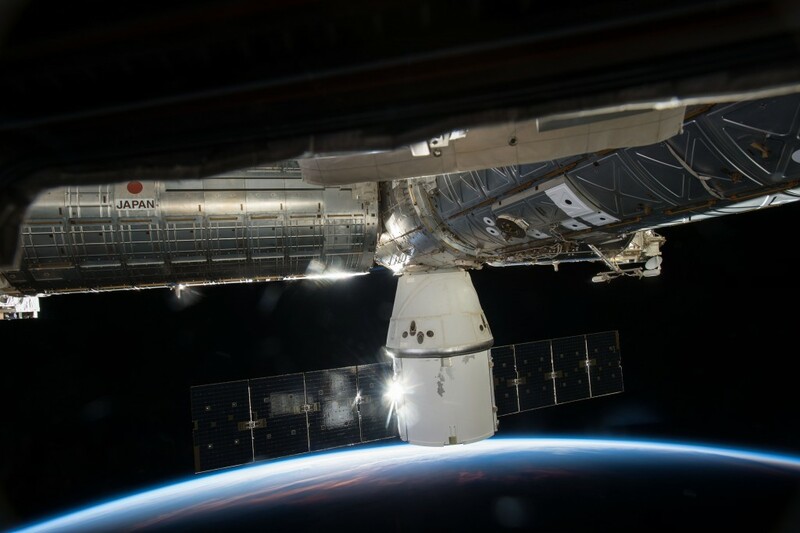 SpaceX’s sixth commercial resupply flight to the International Space Station launched on April 14th and arrived three days later. It will depart with over 3,100 pounds of research samples and equipment and splashdown in the Pacific Ocean on May 21. The USOS crewmembers worked a reduced day today as they prepare to sleep shift in preparation for SpaceX-6 departure on Thursday. The crew performed a checkout of the Commercial Orbital Transport Services (COTS) UHF Communication Unit (CUCU) that the crew will use to communicate with the Dragon capsule while it is flying free in the vicinity of the station. They also continued loading the final cargo items onto Dragon which will return about 3,100 pounds of experiment samples and other hardware. One-Year crew member Mikhail Kornienko took samples for the Fluid Shifts experiment, an investigation into the suspected cause of astronaut vision changes while in microgravity. ESA (European Space Agency) astronaut Samantha Cristoforetti also performed eye scans on NASA astronaut Terry Virts for an astronaut vision study known as Ocular Health which tests microgravity-induced visual impairment, as well as changes believed to arise from elevated intracranial pressure, to characterize how living in microgravity can affect the visual, vascular and central nervous systems. The investigation also measures how long it takes for crew members to return to normal after they return to Earth.